Shades and Glamour is a card game based on an alternate history of the English Regency. The game mimics social life in 1814 — if one adds magic. The goal is to improve one’s social standing. Social standing is the value of one’s cards. One improves it by acquiring better cards. 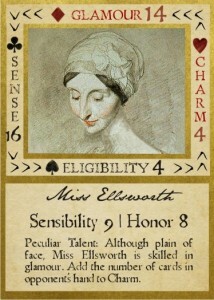 As with all romances, the game ends when a character becomes betrothed by losing his or her last card. To play, you’ll need to download the pdf of the Shades and Glamour game instructions and character cards (15K pdf). You’ll also need a regular deck of playing cards plus some scratch paper and a writing instrument. The pdf download has eight characters from the novel Shades of Milk and Honey: Miss Ellsworth, Mr. Vincent, Miss Melody Ellsworth, Mrs. Ellsworth, Mr. Ellsworth, Mr. Dunkirk, Miss Dunkirk, and Miss FitzCameron.